MindManager makes it easier to think, plan, and communicate. Information is invaluable. But it’s also overwhelming. MindManager puts you in command of the information surrounding your work, business and world — instead of controlled, confused or overwhelmed by it. With improved HTML5 export, you can easily share your maps and create alignment with just about anyone — on your team, in your org and beyond. – Quickly break main concepts into smaller details, while keeping connections simple and clear. – Add detail and context to tasks as you create them, without stepping out of the flow. – Rearrange or replicate information with simple drag & drop. – Uncover hidden connections between topics, tasks and data. – Eliminate redundancies, identify risks and uncover opportunities. – Make better decisions by seeing the downstream impact of actions before you take them. – Transparently communicate ownership, priorities, deadlines and more. – Visually connect related and dependent action items, to eliminate redundancy and encourage collaboration. – View projects by resource, tasks, timeline, in Gantt charts and more for visibility into progress, status, red flags and risks. – Sync related data from Microsoft Office files, content repositories and over 800 apps. – Easily add, correlate and view files, images, links, media and more – for consolidated control over your day, work and world. – Fluidly change the information you’re seeing or showing, without switching windows or splitting screens. – Do you wish you had a better way to manage and communicate your business-critical information? – Whiteboards, presentation slides and spreadsheets can only show you so much, and take you so far. – If you want to transcend the limits on what you can see, create, communicate and achieve, your vehicle has arrived. 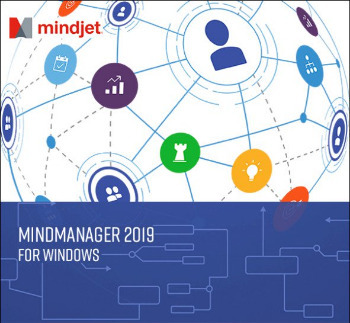 Step into MindManager 2019 for Windows!